This memoir by the formerly famous, pioneering aviatrix/horse trainer/celebrated beauty has rarely received the recognition it deserves. The teeming plains and white hunters of British East Africa, the barely-tested skies come alive again in these masterfully crafted episodes from a life of uncompromising freedom: funny, thrilling and moving. One of my 'desert island' books. 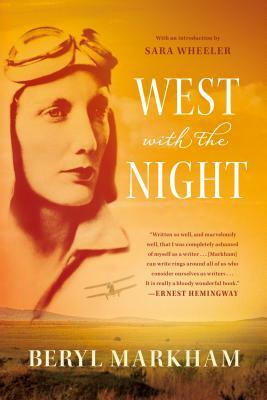 Beryl Markham's West with the Night is a true classic, a book that deserves the same acclaim and readership as the work of her contemporaries Ernest Hemingway, Antoine de Saint-Exupéry, and Isak Dinesen. If the first responsibility of a memoirist is to lead a life worth writing about, Markham succeeded beyond all measure. Born Beryl Clutterbuck in the middle of England, she and her father moved to Kenya when she was a girl, and she grew up with a zebra for a pet; horses for friends; baboons, lions, and gazelles for neighbors. She made money by scouting elephants from a tiny plane. And she would spend most of the rest of her life in East Africa as an adventurer, a racehorse trainer, and an aviatrix—she became the first person to fly nonstop from Europe to America, the first woman to fly solo east to west across the Atlantic. Hers was indisputably a life full of adventure and beauty. And then there is the writing. When Hemingway read Markham's book, he wrote to his editor, Maxwell Perkins: "She has written so well, and marvelously well, that I was completely ashamed of myself as a writer . . . [She] can write rings around all of us who consider ourselves as writers . . . It is really a bloody wonderful book." With a new introduction by Sara Wheeler—one of Markham's few legitimate literary heirs—West with the Night should once again take its place as one of the world's great adventure stories. Beryl Markham (1902–1986) was a British-born Kenyan aviatrix, adventurer, and racehorse trainer. During the pioneer days of aviation, she became the first woman to fly solo across the Atlantic from east to west. She died at the age of 83 in Nairobi, Kenya.